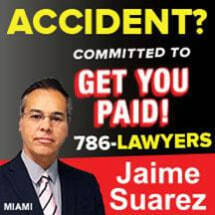 Car accidents can leave people in the Hollywood area in Florida struggling with several problems. Our attorneys at the Law Offices of Suarez & Montero are passionate about helping those who have suffered injury due to the negligent or careless actions of others to achieve financial justice and protection that they deserve. Accordingly, for the convenience of our clients, we offer free initial consultations. Having more than 35 years of combined legal experience, our personal injury team has assisted clients throughout the Hollywood and Miami areas with a range of complex cases, including those involving car and truck accidents, premises liability, and slips-and-falls. We know that people may be concerned about their financial obligations, lost income and mounting medical bills following an accident. Our team negotiates for fair compensation on their behalf and, when necessary, we are prepared to go to court to fight tooth and nail to advocate for their rights. Over the years, our attorneys have recovered tens of millions of dollars in settlements on behalf of our clients. While this is a significant achievement, our primary focus is on seeing each of our clients made as close to whole as possible for their associated losses and damages. We work alongside our clients throughout the legal process, crafting and implementing strategies that incorporate their specific needs and concerns. In addition to representing people who have suffered injuries through no fault of their own, our attorneys at the Law Offices of Suarez & Montero are able to assist clients who have been charged with misdemeanor or felony offenses. When handling cases involving traffic violations, DUI, federal charges or other alleged crimes, we provide the same compassionate, yet honest, counsel as we offer our personal injury clients.